With the California Diamond Jubilee in full sway, with columns of print filled daily with historical material, and reminiscences of men and women whose hey-days were spent in the colorful San Francisco of long ago, it is only natural for one of the Far Wests oldest magazines to come forward with claims to fame. The News Letter was established on July 20, 1856, in this city, by Frederick Marriott, also founder of the Illustrated London News. Twenty years after the News Letter was first printed, the telephone was invented by Alexander Graham Bell, in 1876. In 1878, San Franciscos first telephone instruments were installed in the News Letter office at Merchant and Montgomery streets, and in Mr. Marriotts home at the corner of Jones and Lombard streets. Today, San Francisco has 28.8 telephones for each one hundred inhabitants, the highest average of any important city in the world. Obviously, the honor of being the first subscriber is not a small one. Telephone growth is a barometric indication of national, state and civic development. The metal threads of Americas telephone lines are now inseparably woven into the fabric of modern business, professional and industrial life. Many telephone buildings have been constructed in San Francisco within the past two years, the most notable of which are the new one million dollar, six-story business office and exchange building, at 444 Bush Street, and the recently completed Graystone Exchange Building, at Bush and Larkin streets. The most conspicuous structure, however, is the magnificent 26-story, Coast Division Building of the Pacific Telephone and Telegraph Company now practically completed and fully occupied. 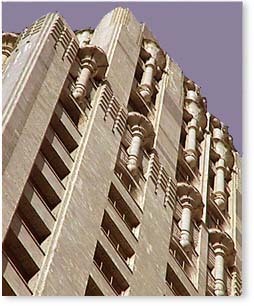 This skyscraper graphically indicates the trend of business architecture from the ornate and rococo styles of former years to designs in which simplicity is tempered with a rugged beauty essentially western in character. The telephone companys Coast Division building stands on the site of a four-story brick and concrete structure, at 140 New Montgomery Street, designed by A. A. Cantin, who was associated with the firm of Miller & Pflueger in planning the present edifice. The old building housed telephone company General Offices and 600 employees until it was destroyed in 1906. San Franciscos new skyscraper contains the telephone companys General Offices and various departments of the Bay and Coast Divisions, providing space for 2,000 employees. It houses no operating equipment and replaces offices formerly located in eight variously situated buildings. The skyscraper is located on the west side of New Montgomery Street, with a frontage of 160 feet on the latter thoroughfare and a depth of 147 feet on Minna and Natoma streets. It is L shaped with full frontage on New Montgomery Street and a wing extending the depth of the lot on Minna Street. Eventually a wing will be built on the south side. The interiors are entirely fireproof and are exceptionally well lighted. Its features include a cafeteria for women employees and an assembly hall seating 400 people. The building was started on January 1, 1924. In erecting this monument to western progress and foresight, the telephone company brings home a definite realization of the tremendous importance and extent of our communication facilities. The initiative and resourcefulness is the same sort that animated the first publisher of the News Letter in subscribing for the first telephones in this city, qualities reinforced by an unbounded faith in the future of San Francisco and California.